**Note on sound – If running on an analog track, you will hear the diesel engine sound. The bell, whistle and other sound functions can only be controlled if running on a digital system. 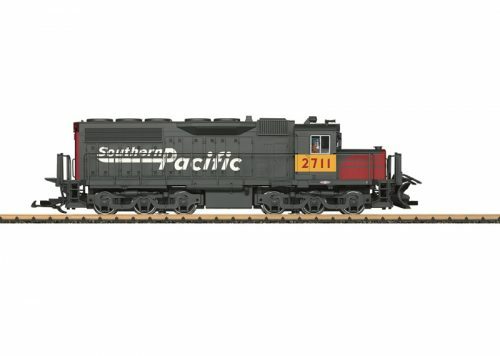 This is a model of a heavy American SD 40 diesel locomotive painted and lettered for the SP (Southern Pacific Railroad). The paint and lettering are prototypical for Era V. Both trucks are driven by powerful Bühler motors with ball bearings and the locomotive has traction tires. The locomotive has a built-in mfx/DCC decoder with a variety of authentic sound and light functions, all digitally controlled. The locomotive has many separately applied details and doors to the cab that can be opened. Length over the couplers 63 cm / 24-13/16″.